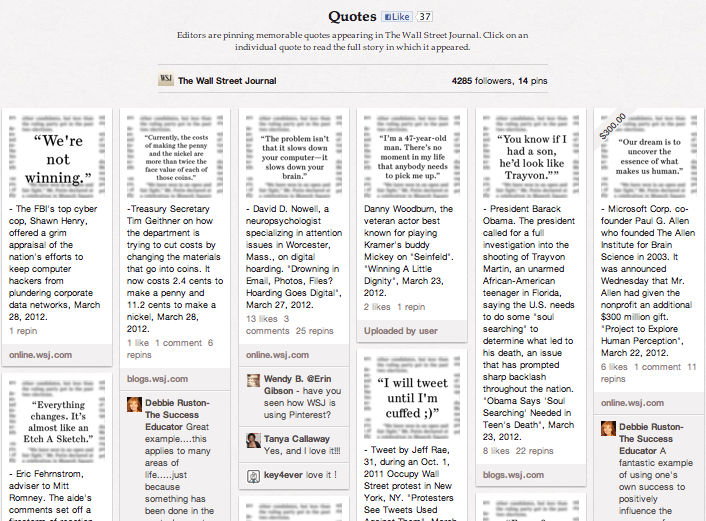 Earlier this week, I saw a fantastic article on how the Wall Street Journal is using Pinterest. Yes, you read that correctly. When I think of the Wall Street Journal, I think of a paper that is full of black and white, tiny text about dry, financial matters. When I think of Pinterest, I think of beautiful, colorful pictures, mostly of shoes and dresses. How can these two entities possibly work together, while retaining their individual purposes and branding? The answer is: juicy quotes. It's easy to dismiss a social media platform because it isn't, at first glance, a natural fit for your organization. It's how people felt about Twitter, initially: "Nobody cares what I ate for breakfast." But the deeper you dive and the more creative you get with it, the easier it is to find innovative ways to make use of it. What's the most innovative approach you've seen on Pinterest, or any other social media platform, lately?